It is not surprising, by what we have seen, that whenever one ventures off the path of the real, where plasma is a factor, super-exotic dreams become conjured up to imagine gravitational effects for the observed phenomena, which aren't really possible. One such case is the Cygnus X-1 binary star system located 6070 light years distant. 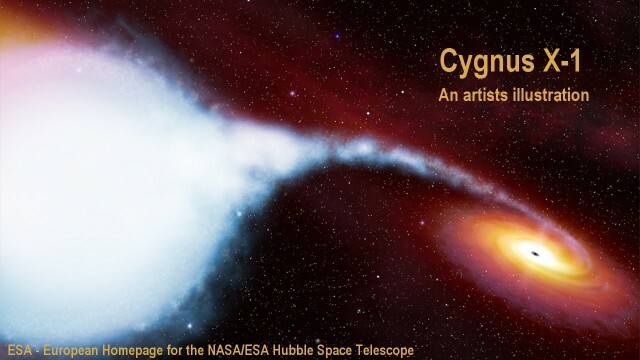 The Cygnus X1 system is a well-known galactic X-ray source that is widely regarded to incorporate a black hole that is deemed to generate x-ray emissions. 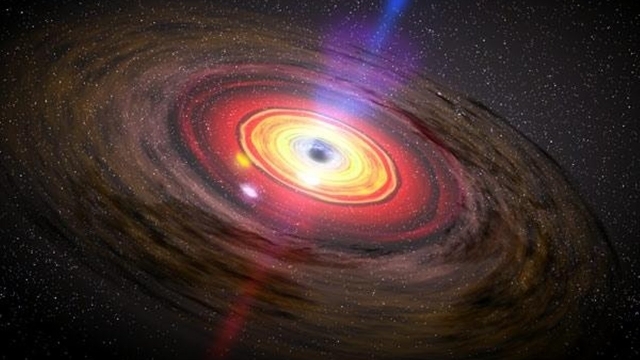 It is theorized that the stellar wind from a supergiant star is drawn to the black hole where its atomic material accumulates into an accretion disk. It is further theorized that the inner region of the disk is heated to millions of degrees by the gravitational effect of the black hole. It is theorized further, that in the process of the black sun's gravity tearing the atoms apart at the innermost region of the accretion disk, a vast flood of X-ray light is emitted. The pair of jets is deemed to be emitted perpendicular to the disk, by magnetic fields, that are deemed to be carrying the captured energy and torn up material, away into interstellar space against the force of the black-hole's gravity. The result is a finely spun tail, though again an impossible tail for all the reasons previously discussed, except one. 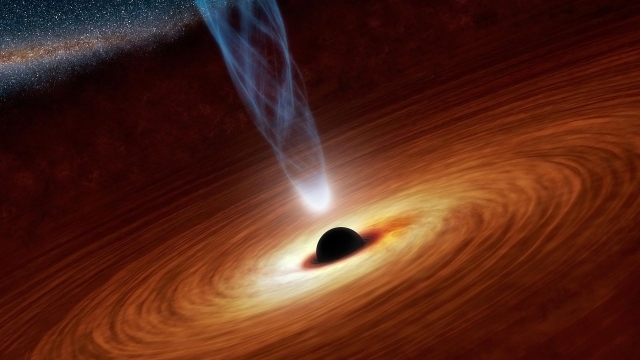 The theorized accretion disk around a black hole is not possible. Accretion disks are electrically organized structures. From the orbits of the planets, to the rings of Saturn, to the disk of the galaxy itself, in every case, we look at electrically organized features, not features of gravity. An electrically inert, gravity-only star, cannot produce the feature illustrated here, except in dreams. However, in the plasma universe a much simpler picture comes into view for what has been observed about the Cygnus_X1 system. We see a giant star, 20 times as wide as as our Sun and 300,000 times more luminous. We see it powered by an equivalently wide sphere of plasma focused on it by its correspondingly large Primer Fields. In the sphere of dense plasma focused around the large Sun, we see a secondary star orbiting in close proximity, perhaps as close as half the distance of the orbit of Mercury to the Sun. The close relationship means that we see the secondary star deeply immersed within the sphere of concentrated plasma that powers the large star. 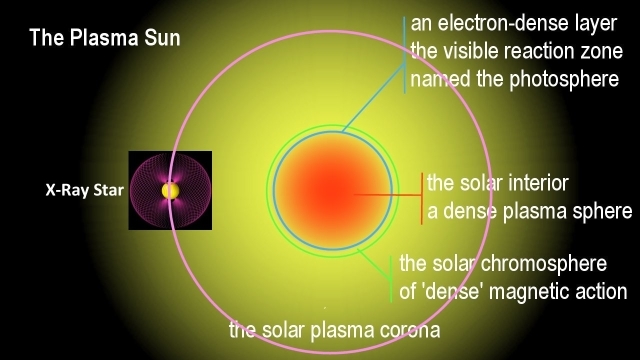 Within the all-enveloping dense plasma environment, the secondary star would have its own primer fields that focus a still-more concentrated shell of plasma around it that support the type of super-intense solar activity that can create a surface temperature in the range of millions of degrees. The solar action of the secondary star would be so intense thereby that the star's emission spectrum would be shifted upwards into the high-energy bands, way past the UV band, into the hard-x-rays band. 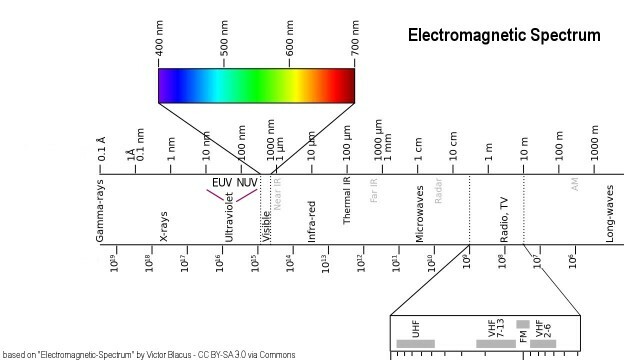 The extreme energy emission takes the resulting spectrum far outside the visible band. The intense star would appear as a black sun that is only visible in x-ray light where it is 'seen' bright and clear. In the plasma universe no accretion disk is needed to cause the observed phenomenon. No mythical black hole is needed either. No super-normal phenomenon is required. In other words, Cygnus X1 is simply a binary star system operating in a dense plasma environment. With the visible star having a measured surface temperature of 31,000 degrees, its super-intense companion will likely be powered up to many millions of degrees. No magic is needed for the emission of x-ray light. Thus, the Cygnus X-1 system, stands as a fine example of evidence for the plasma universe. Now what about the illustrated conical jets above the hyper-active black sun? They are evidently not jet-steams at all. Jet streams are not typically conical. What is illustrated here, is the plasma structure of the hyper-active star's primer fields, of the type that has been replicated at Los Alamos National Laboratory with high-energy plasma-flow experiments. 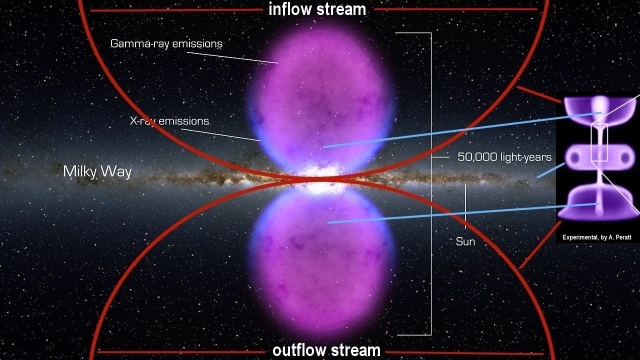 The so-called jet-streams, are simply on the small scale, comparable to the plasma features on the galactic scale, that NASA has photographed extending from the center of our galaxy, below and above the galactic disk to up to 25,000 light years. 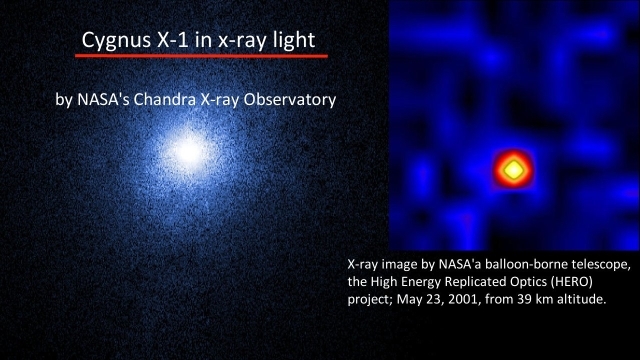 The features that NASA has discovered do likewise emit light in the x-ray band, and even in gamma-ray band. Both light bands have been detected in Cygnus-X1. 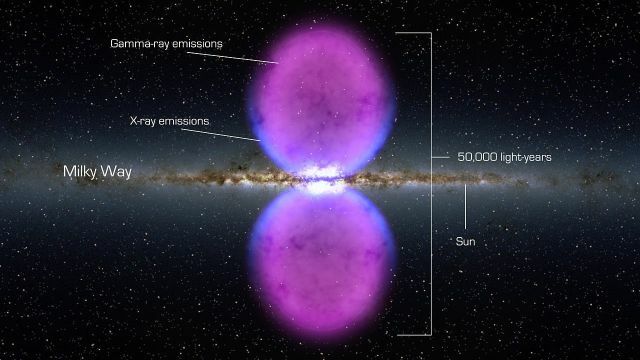 As I said earlier, the discovered plasma domes over our galaxy are nothing more in principle than the confinement domes of the primer-field structure that focuses plasma onto our galaxy from interstellar plasma streams. Exotic concepts are not required . It would be surprising if we didn't see this natural principle expressed in the small in the Cygnus X1 system, associated with the hyper-intense star. Nothing exotic is happening in both cases.